The new feature lets real estate agents, franchise groups, et al, to upload their listings directly to Google Maps. There is no cost. Clicking on a marker or a small circle will provide more information about the listing, as well as the contact details of the listing agent and a link to their website. Might even be useful! And another good example of the commercial sector grabbing onto the potential of geographic search/discovery. Would be great to see the cultural sector following suite. "the presentation of listings on Google maps reflects the same data that is shown on realestate.co.nz the issue is that as a mapped based application they can only show listings with an address - this relies on agents providing us with an address (which only about 60% do!) - we then provide these to Google - so to get the full picture of all properties for sale (we have around 93% of all licensed agents on the site) you need to rely on the main property website such as realestate.co.nz. 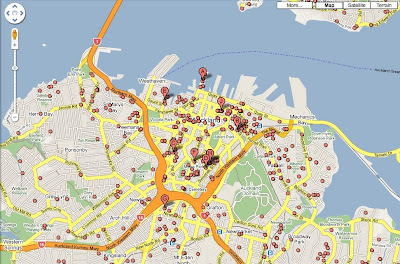 So another example of a mapping application which struggles to get to the top of its game because the originators of key socio/economic data [in this case the agents] need to start thinking geo-coordinates [addresses to you and me] as a core part of their data-set, instead of just an optional extra? The company then Designer handbags polishes the cases and engraves the numerals and markings with a laser. The bezel, interestingly, Watches Replica is made liquid metal, the same amorphous metal alloy used in many phone cases.The watch model Replica Rolex watches itself is famous for being the first watch worn on the moon, a distinction that was actually more accidental than UK Replica watches wants to admit. During preparation for the 1965 Gemini flights Replica Rolex Watches.